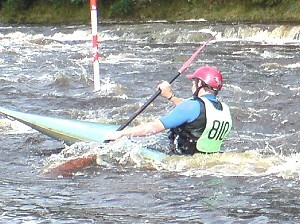 The Slenningford Watermill slalom event is located at West Tanfield in North Yorkshire, 5.5 miles north of Ripon. The event is run by the West Yorkshire Canoe Club, based in Pontefract, West Yorks, and normally takes place towards the end of September. The course is a Div 3/4 open event and is normally entered by over 200 people over the weekend - one of the largest events on the calender. The course generally starts at the end of the island section of the grade 2/3 rapid and follows the rapid around the corner to the flat section. 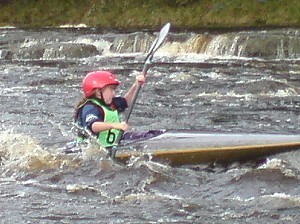 Generally Div 4 paddlers seem to be able to cope on the rapids, and the course is often used by new upcoming paddlers. If you are not paddling, there is always plenty happening nearby. Within 30mins from West Tanfield are Lightwater Valley Theme Park and the city of Ripon. Because the slalom is run on a campsite, you're never too far away from the action. The site is well known to kayakers and has all the facilities you need, including flushing toilets, games room (Slalom Control), site shop and kayaking shop! Also, since the 50th birthday party of the West Yorkshire Canoe Club a hog roast has been organised, and it's an excellent evening! 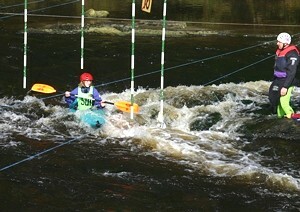 Come along to one of the largest slalom events on the calender, and have a great social weekend!